There has been an immense number of debates for years about where the safest and healthiest place for a newborn baby to sleep is. This is a very crucial time in a young child’s life and with many threats, such as Sudden Infant Death Syndrome, and so there are many precautions that need to be taken. There are several contradictory opinions on the subject, but the most important thing to keep in mind is that parents need to find something that works with their lifestyle that keeps their child safe. No one else’s opinions really matter as long as the child and parents are both happy and healthy. 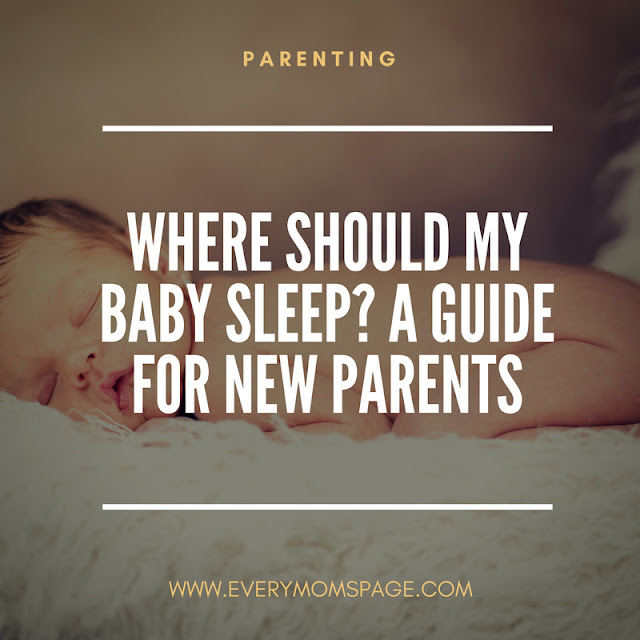 If you are completely lost in the process of trying to decide where your first-born child should sleep, or if you are a repeat parent looking to make a change, then here are a few of the most popular and widely utilized options you could consider. This practice involves a child sleeping in the same bed as its parents. This method is controversial and not medically advised because it runs the risk of the child being inadvertently crushed by the parents rolling over in their sleep or being suffocated by blankets and pillows. However, those who take part in it claim that they develop a very close relationship with their child in those vital first weeks of life. This practice involves a three-sided crib or cot that can be attached to the side of the parent’s bed. This gives the child their own sleeping place while also allowing them to be extremely close to their parents. This allows the parents to attend to their needs quickly and also allows a strong parental bond to develop. Mothers can easily retrieve their child for nighttime breastfeeding without even having to leave her own bed. Co-sleeper cots are considered the safest way of co-sleeping and is medically advised as a safe alternative to bed-sharing. The website www.cosleepercots.co.uk reviews cribs and offers sound information on co-sleeping in this manner. Co-sleeping with the baby in the same room as the parents involves the child having their own sleeping space such as a crib that is not attached to the parent’s bed, but it is still close-by in the same room. This allows parents to quickly react if their child needs their attention, but it also gives both parties their personal space. Utilizing separate rooms means that the parents sleep in one room while the child sleeps in a completely separate room. This makes attending to the child’s needs a little more difficult and time-consuming, but it allows both the child and the parents to have space and it gives the children more autonomy. If this method is employed it is advised that parents use a baby monitor or some other device that allows parents to keep tabs on the child without physically being in the same room. It’s also not advised for newborns. This tactic utilizes the separate rooms method described above while also allowing the child to enter the parents’ bed if they need to be soothed or have any other issues. This method becomes a little more popular as children get a bit older and start to encounter nightmares or other nighttime issues. The sleeping arrangements listed above do not constitute a comprehensive list. There are other ways parents can handle where their child sleeps, but these are just some of the most popular and widely used. Many new parents find that they need to experiment with several different tactics before they find the perfect one for their family. Some parents even find that it is helpful to utilize a combination of these methods. Parents have also discovered that certain sleeping arrangements are more conducive to certain ages than others. Hopefully, the above options will give you an idea of where a good place to sleep for your child might be.